Lest you think book reviewers live isolated lives untouched by the normal ups and downs of daily life, then you should be aware that the simple act of reading can often times be a complicated affair requiring well thought out choices. Case in point, in the past few weeks I’ve been dealing with lower back pain; most likely a bruised disc. At the same time my mother-in-law, who lives with us, has been suffering ill health brought on by bronchitis which in turn led to congestive heart failure and in the past two weeks has been in and out of the hospital four times, three by ambulance. Even as I write these words, she is a patient there. All because her flu/bronchitis forced a change in her routine meds which now is unbalanced and causing her undue lethargic collapse. And there’s not a thing we can do until the medical folks re-calibrate what her proper med-cocktail should be now. Why do you need to know all this? Only because I had not planned to read this particular book next after finishing Ronnie Seagreen’s SEVENTH DAUGHTER. Sitting on atop my to-read-and-review stack was a publisher’s advance reading copy of a new book by Andrew Gross. So when my mother-in-law collapsed the other night, for the second time in four days and my wife was calling 9-1-1 and all of us were gearing up for our next trip to the hospital and emergency room, I realized I needed to bring a “fast” book with me, one that would help me wile away long hours of waiting. What’s a “fast” book as opposed to a “slow” book? Easy answer. We all have writers we enjoy and have read over and over. Enough so that we know that they do, on most occasions, entertain us, whereas new writers pose a mystery that cannot be unraveled until we’ve allotted them time to get to know them. Whereas I have never read any of Gross’ work, I was not about to drag it along with me on the chance it would be a good read. If it were not, then I’d be trapped in that hospital lobby, watching time slowly crawl along with a book I did not enjoy. Not why any of us read. So, preparing to dash out the door once the ambulance had rolled away, I opted to grab a book from a writer whose past work has entertained consistently, thus making it a “fast” read. One that would take my mind off a less than pleasant time in our lives. And thus I picked up ODD HOURS. Note the irony of the title itself because dear readers, there are no odder hours spent in this world than in a hospital waiting room. Now on to our regularly scheduled review. ODD HOURS is Koontz’s fourth thriller starring his psychic hero, Odd Thomas. He was to be named Todd, but a misprint on his birth certificate left him with a unique name to match his unique talents. Odd can see the dead, or those who still linger for whatever reasons beyond this world and the next. He can also sense future events but only those that portent some catastrophic destruction. As this particular episode in Odd’s life opens, he’s living on the California coast, in a small hamlet as the live-in housekeeper to a retired Hollywood actor. It’s a good job and considering the experiences he has endured and survived in his previous adventures, Odd is more than satisfied with the ho-humdrums of life. Sadly the cosmos is not about to let him have too much R & R and all too quickly Odd is neck deep into another life-or-death adventure. He has a dream involving a nuclear disaster and soon learns this vision is tied to several men employed by the town’s harbor authority. Then, upon meeting a mysterious young pregnant woman on the public docks, Odd is set upon by a trio of thugs who somehow recognize him as a threat to their evil plans, whatever those might be. Odd is running for his life, attempting to elude these merciless killer while at the same time uncovering whatever their evil plot is. Along the way, as is always the case with Odd’s exploits, and Koontz’s writing, he stumbles on an eccentric assortment of colorful characters who serendipitously come to his rescue like the proverbial cavalry; just in the nick of time. Among these are young woman horribly disfigured by her drunken father, a kind widow who drives around the fog-shrouded streets at all hours of the night looking souls in need of help and the ghost of Frank Sinatra. That last one provides several memorable scenes that are some of the funniest Koontz’s has ever invented. All in all, you know Odd is going to somehow manage to save the day and good will triumph, but the ride to that finale is a treat, one to relish. 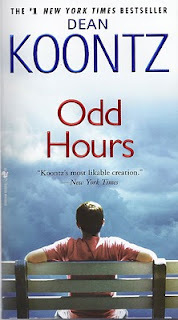 ODD HOURS, like most of Koontz’s work, is the literal equivalency of comfort food. It never fails to satisfy. Some people are destined from birth to do great things. 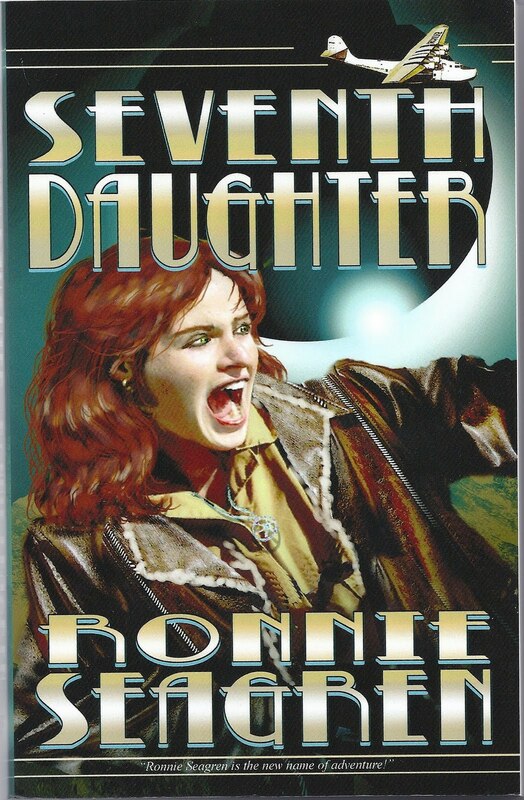 Gil Orlov is born at the zenith of a full solar eclipse, the seventh daughter of a seventh daughter. She is the end goal of a carefully planned genealogy begun by her predecessors hundreds of years earlier, all women of remarkable psychic abilities. Through this family history a prophecy has evolved which predicts the end of civilization will occur in the mid-twentieth century unless a seventh daughter of a seventh daughter can forestall it. In 1937 Gil is a college student ready to begin her monumental journey to a holy site high in the Peruvian Andes known as Killichaka, the Bridge to the Moon. She and her six older sisters must be must find an ancient ruins and there perform a holy ritual at the height of yet another eclipse. If completed, Gil will be gifted with amazing powers which will allow her to manipulate world events and prevent the global disaster her ancestors have warned of. Since childhood she has had horrible visions of a world consumed in nuclear fire and with the advent of another world war, Gill is convinced those visions vindicate the family prophecy. What Gil and her sisters are unaware of is that they are being shadowed by someone with an all-consuming hatred for their family; an abandoned eight daughter. Gamella is Gil’s identical twin, born only minutes after her sister. Her surprise birth set into motion a deep dark secret that now threatens to unravel Gil’s mission and bring about chaos and destruction. Amidst this frantic race for Killichaka between the two groups arises a third and crucial figure, Gil’s former economics professor, Galen Williams. To complete the sacred ritual, a guardian is needed to protect the candidate of power and Gil, before leaving the campus, invites Galen to assume that role without being completely forthcoming with him about her mission. When he finds himself alone and lost in Lima, he is easily duped and recruited by the evil Gamella, believing her to be Gil. She sets about seducing him with offers of wealth and power if he will assist her in becoming the ritual candidate. SEVENTH DAUGHTER is one of the most original and mesmerizing adventure plots to come along in a long-long time. Ronnie Seagreen spins her story with the perfect balance of action and characterization. No easy task with such a large cast, but she does so effortlessly and all of Gil’s sisters come to life with their own distinct personalities and traits. She is also to be applauded for her brilliant, authentic depiction of the locales so that the reader is pulled along with every hard breath and body ache required to survive in such a harsh, high altitude world. The book’s final quarter had me turning pages frantically wanting to keep up with the action, it culminating in a rewarding and powerful climax that will leave you as drained as the characters. This is a brilliant first novel by a writer of tremendous talent not to be missed. Move over Clive Cussler, Ronnie Seagreen has arrived. With what weapon did Cain murder his brother Abel? The first crime, as described in the bible strangely omits that particular detail, focusing instead on the moral outrage of the act itself. Could that unknown instrument still exist today? If so, it would easily become one of the most sought after prizes of the archeological community, not counting fanatical religious groups who would most likely imbue the object with arcane properties. This is only the first of writer Brad Meltzer’s outrageous plot lines in this convoluted thriller. The second is no less fantastic. Calvin Harper works for homeless shelters in Ft.Lauderdale Beach, Florida. He and his partner, an ex-black minister, drive around the community picking up society’s forgotten souls and doing whatever they can to make their lives a little better. One night, in response to a police call, they find a man covered in blood from a gun shot wound, in a deserted park. That man is Cal’s father, Lloyd, whom he hadn’t seen in over ten years. Lloyd had been imprisoned for manslaughter, having accidentally killed Cal’s mother when Cal was only nine. Which is where this pretzel of a plot twists again. It seems the bullet that wounded Lloyd Harper came from the same gun that in 1932 killed a Cleveland tailor named Mitchell Siegel. It was Siegel’s son, Jerry, who a few years later would create, with the help of his artist pal, Joe Schuster, the greatest comic book icon of all time, Superman. Once the details of this earlier crime, which was never solved, begin to surface, Cal finds himself lost in an historical maze of seemingly unrelated events. Did someone actually discover Cain’s weapon? Did that same person kill Jerry Seigel’s father in 1932 and why are they now trying to eliminate Cal’s father? Like all decent thrillers, no sooner is Cal embroiled in this phenomenal mystery then he becomes a target of a psychotic killer working for an ancient occult secret society. From Florida to Cleveland, the Harpers race frantically attempting to solve the riddle at the same staying alive in the process. THE BOOK OF LIES is a captivating flight of fancy that offers up wonderful moments of acute emotional insights into why we need heroes in an imperfect world. If you’ve ever picked up a comic as a kid and wondered what if, this book will pluck long lost musical notes in the attic of your memories. Give it a try, you might uncover something you’d thought gone forever. The world of professional boxing has historically been tainted by organized crime on many occasions. There are those who believe even when completely legitimate, the sport lends itself to same kind of conspiratorial greed and immorality that make up the mob. Writer Peter Blauner holds up these twin mirror reflections as the backdrop to his noir-like story of Anthony Russo, a struggling young man wanting to severe his ties to one of these worlds and escape into the other. By the time the tale spins itself to its inevitable conclusion, the realization that both are same in their cold-blooded ruthlessness is Anthony’s tragic epiphany. Living in Atlantic City, Anthony is married, has two kids and his wife, Carla, and is pregnant with a third. Anthony’s father, Michael, mysteriously disappeared when he was a child and his mother remarried Vincent Russo, the right-hand man of gang boss Teddy Morino. Although he loves his stepfather, Anthony wants no part of his Mafia brotherhood and this remains a point of contention between them. Add the fact that Carla is Morino’s niece and the friction between Anthony and mobsters continues to intensify. When his construction business beings to fail, he finds himself in debt to aging, obese mobster. 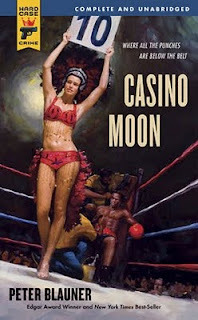 Afraid his life will imitate that of Vin’s, Anthony hatches a desperate scheme to become a fight promoter for a washed out ex-champ at the local casino. Envisioning a payout in millions, Anthony must learn the ins and outs of professional boxing while at the same time keeping Teddy and his cronies in the dark. When he learns his plan requires a great deal of cash before anyone will take him seriously, he goes to a loan shark and digs himself in deeper. There are palms to be greased at every step of the process, from crocked to commissioners to promoters and casino officials, all of them demanding a piece of the action. Anthony’s pot of gold at the end of his wishful rainbow begins to dwindle long before the actual fight is even scheduled. A man obsessed with changing his fate no matter the cost, a once beautiful showgirl willing to be used to save herself and her daughter, and a soulless, pathetic gangster dying of prostate cancer believing he is owed respect and tribute. These are only a few of the intense and complicated characters that Blauner lets loose in a setting that is all phony glitter disguising an underbelly of relentless despair. CASION MOON is a mesmerizing drama that will draw you in and hold you captive until the final bell, where the only winners are those smart enough not to bet against the house.